The first thing you should know about Chess With Friends is that it does not require you to have any friends with whom to play chess. Chess With Friends or Random Acquaintances would be a cumbersome and stupid name, but it describes the app best—and highlights its appeal. It’s the next best thing to wandering down to the park or local café and sitting down with a stranger for a game. Check, Mate: Gameplay is pretty straightforward in Chess With Friends which lets you use the networking capabilities of an iPhone or iPod touch to challenge others to a game of chess. Chess With Friends exploits underused networking capabilities of the iPhone and iPod touch. Many apps make use of the device’s GPS tracking feature. And heaven knows there are about a thousand tilt games. But how many allow online game play? Not more than a handful—including, as it happens, a checkers game. Getting started is the hardest part about Chess with Friends. The sign-up process is somewhat cumbersome. You need to provide an e-mail address. The app also encourages you to divulge your phone number, but this is optional. Once you’ve logged in, you create a game by tapping the Create Game button on the app’s home screen or by touching the plus sign in the upper right corner of the page. Then you can choose an opponent from your device’s contact list or by selecting Random Opponent. The app will search out another opponent available for play. Finally, you can choose Pass and Play, which simply lets you hand off your device to a friend for a local game. I noticed a comment on the game’s App Store page in which the user complained that there is “no way to play against the computer.” Well, the entire point of the app is to play with other, live human beings. 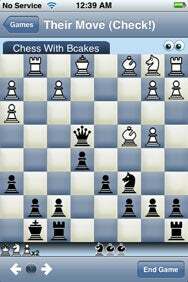 By my count, there are about 26 other chess game apps available for download. Some of them are so sophisticated, they’ll practically play the game for you. But for those of us who think a Ponziani Gambit is just another pyramid scheme, Chess With Friends works just fine. Gameplay mechanics are straightforward. Simply tap the piece you want to move. The app will show you which squares are open to you. Tap the square where you want to go and hit the Submit button. If you have second thoughts, hit the Cancel button instead. But once you submit the move, there are no take-backs. If you are accustomed to speed chess, then Chess With Friends is definitely not for you. Although I’ve played a few games in which my opponent was actively engaged, the app is really about leisure chess: Make a move, wait an hour or two —or even longer—for your opponent’s next move. To give you an idea of just how leisurely paced Chess With Friends is, your opponent automatically resigns if he hasn’t moved in a week. So the more games you have going, the more satisfactory Chess With Friends likely will be. I have four games going at the moment. I think I’ve averaged two moves a day for the past week. One quibble with Chess With Friends: The app is not very good at alerting you to your next turn. In theory, the app’s home screen icon should show you how many moves are awaiting your attention with a number encircled in red, similar to an e-mail or application update alert. In practice, however, you need to open the app for your games to update. A prompter alarm would make for speedier games. It isn’t difficult to imagine how Chess With Friends might evolve with future updates from developer NewToy. For the moment, it’s impossible to know just how many players are online and looking for a game. You are left at the mercy of the app to find an opponent for you. Why not embrace the social networking concept completely and let players choose? The app would also benefit greatly from a leader board, which would in turn fuel competitions. New players would undoubtedly wish to test their skills against the top dogs. And it would be nice to be able to seek out past opponents for grudge matches. There is a player named Ouyang who cleaned my clock the other day. I’d like another shot at him.